Every so often you will find a special location,building or landscape on Pinterest/Instagram that has been completely untouched by the mass tourism. No, I am not talking about the Colosseum in Rome or the Leaning Tower of Pisa, but The Eyes of God (Prohodna) Cave in Karlukovo Bulgaria. This beautiful cave structure has been under the radar in Europe for many years and has recently gained some popularity online. After my visit to the cave in the summer of 2017 (See blogpost: 25,000 Km Road Trip Trough Europe – Bulgaria) I completely understand why this is the case. Even during my visit I was almost alone, therefore I strongly recommend to visit the The Eyes of God (Prohodna) Cave as soon as possible, before it becomes another tourist trap. This is my guide on How to visit The Eyes of God (Prohodna) Cave in Karlukovo Bulgaria. 1 Where is The Eyes of God (Prohodna) Cave located? 2 How much does it cost? 5 Where to stay when visiting The Eyes of God (Prohodna) Cave. Where is The Eyes of God (Prohodna) Cave located? Located nearby little village of Karlukovo, the cave is a 10 km drive from the town of Küshata. The caves are easy accessible by car and you only need to drive about 100 meters offroad to reach the parking lot. Once you have parked your car it is about 300 meters walk to the cave itself. Next to the parking lot you will find an information cabin, which has all the information about the area and the history of the cave. Well, that is the good part about hidden treasures that are not discovered yet by the mass tourism. The cabin and the cave can be visited free of charge. Free! Formed during the Quaternary, The Eyes of God (Prohodna) Cave is a stunning 262 metres (860 ft) long on is one of the longest cave passages in Bulgaria. The cave owes its name, which literally means Thoroughfare Cave or Passage Cave, to these eye shaped holes in the ceiling of the cave. The eyes are located in the center of the cage at a height of 42.5 to 45 metres (139 or 148 ft). You can also do bungee jumping from the cave entrance, but no activities were present when I was there. Therefore, it might be wise to inform at your hotel or a travel agency about such activities. It was also used for the movie The Expandables 2. After I visited the cave, a local person told me to visit the Medieval church “Assumption”. The beautiful little church is located about 5 km. from the cave. Keep in mind that you wil get a little tour from the church priest, but he does not speak a single word of English. It was so funny, but he is very nice so please give him a good tip! Where to stay when visiting The Eyes of God (Prohodna) Cave. I stayed in the city of Küshata that surprisingly has a lot of fun activities to do. There are golf courses, horse back riding, quad driving and many more activities available. My hotel was the Diplomat Hotel, which has two locations in the city. I recommend you booking at mine as it was almost 50% cheaper, but you can use all the facilities of the luxury one (Hotel Diplomat Plaza) with 50% discount. 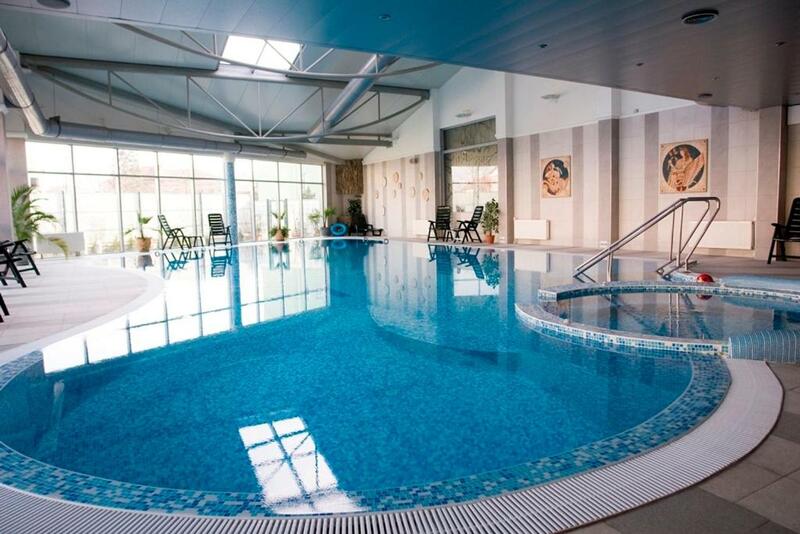 Massages, swimming pool, gym and much more! It is all there for just 4 Euro! Average price per night is 30 Euro.